What are Councils doing about Webcasting? You are here: Home / What are Councils doing about Webcasting? Here at Audiominutes, we have undertaken a detailed analysis of the approach taken by local authorities and unitary bodies in the UK to increasing accessibility and engagement by webcasting (either via audio or video) of their public meetings. 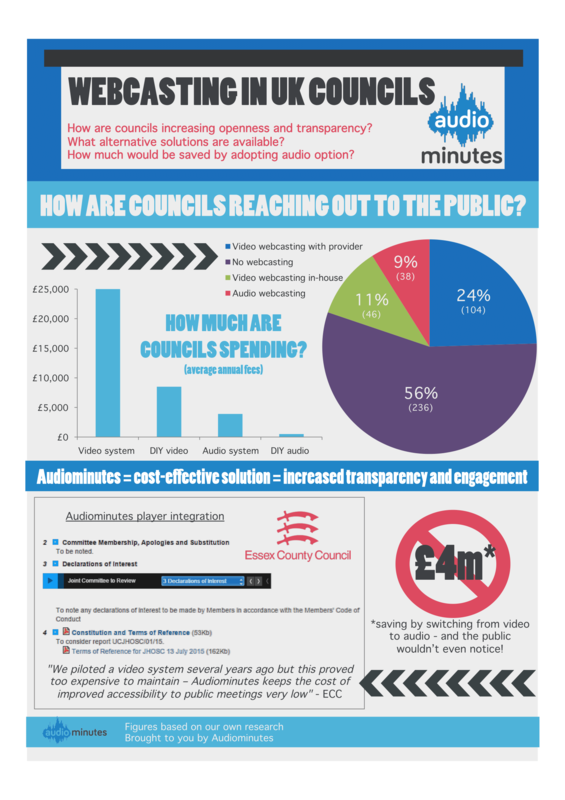 We’ve presented the results in the form of the attached infographic.Audiominutes Webcasting Infographic (PDF format). The fact is that audience numbers can scarcely ever justify the cost and intrusion of video webcasting. A well designed and fully integrated ‘light-touch’ approach such as Audiominutes deleivers the desired improvements in accessibility, openness and transparency but at modest cost.